The German Football Association (DFB) is expanding its existing partnership with the leading German sports betting provider bwin. In the future, the cooperation will include advertising rights for the DFB and the national teams for a term from 1 January 2019 to 31 December 2022. In addition, bwin has acquired advertising rights for the DFB Cup, the 3. Liga and the Women’s Bundesliga. 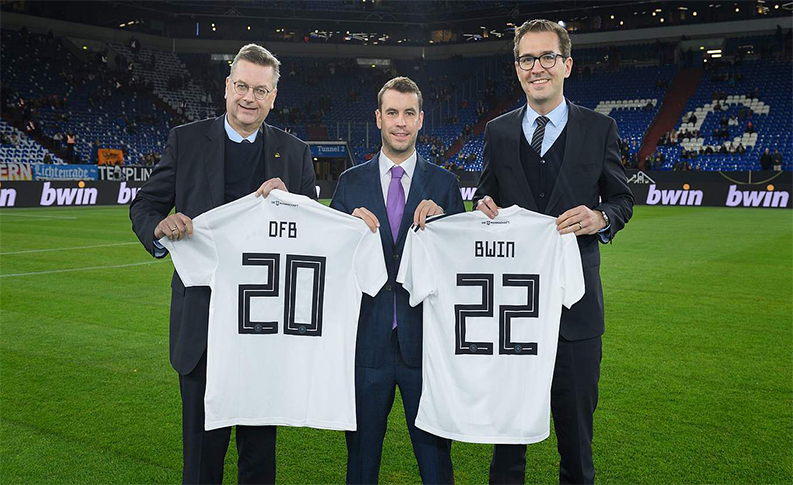 As part of their partnership, DFB and bwin will reinforce and develop their commitment to addiction prevention and integrity. The rights period begins on July 1, 2019 and runs over three seasons until the end of June 2022. The award of rights is the result of a call for tenders from the DFB last year. The extended partnership includes, among other things, gigs, hospitality, online and offline integration into the respective means of communication of the DFB, the national team and the competitions, advertising of the corresponding logos as well as social media integration. The company bwin has been the main partner of the 3rd league since 2017. As part of the partnership, bwin advertises on the jersey sleeves of the third division, in the stadiums as well as in the publications and online appearances of the clubs.